The graphic below has been prepared based on the data from the Irishmen who enlisted at the New York Rendezvous in July 1863. It highlights the extent to which these 131 men were scarred. On some of the records the cause of scarring was also noted; these included burning and smallpox. Other medical conditions were also occasionally mentioned. Although in the majority of cases the cause of individual scars was not recorded, it is likely that they resulted from a combination of illness, workplace accidents and interpersonal violence. The impact of smallpox on the population was apparent, with a number of men bearing the marks of the disease. 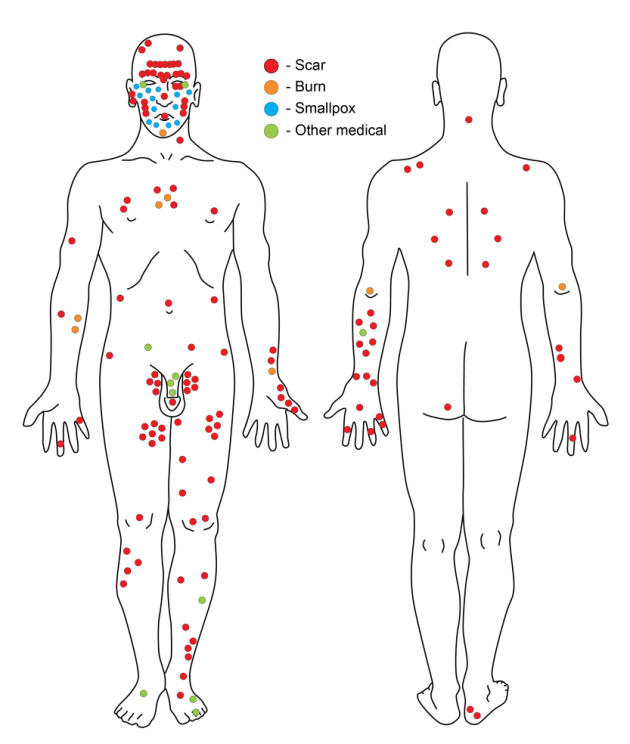 23-year-old Christopher Toole was described as being ‘pitted by smallpox’ while 27-year-old Richard Stretton had a ‘pockmarked face.’ It is probable that smallpox had caused much of the other scarring prevalent among the group, even when it was not specified. Undoubtedly some of the scarring was as a result of workplace mishaps. Sixteen of the men had worked as Firemen; 45-year-old James Morgan and 25-year-old Michael Rooney both had burn marks on their bodies as a result. Similarly it is possible that 33-year-old machinist Charles Smith lost the little finger of his left hand while operating equipment. However, inter-personal violence had also taken its toll. It is hard to imagine how 29-year-old painter John Browne could have lost part of his right ear on the job. By far the most dramatic cause of scarring among the group belonged to Richard Smith, a 21-year-old machinist. Incredibly he was recorded as having ‘gun shot scars’ on his cheek and his left temple. The fact that he was even alive to enlist in July 1863 seems something of a miracle. Violence was part of everyday reality in working-class New York, and it would have been a fortunate man who navigated his way through life without encountering it. In a number of cases the recruiters also took the time to note medical ailments. The prospective mariners were stripped for examination before being accepted into the service, leading to the recording of conditions (such as phymosis/phimosis) which were present in even the most private of locations. 34-year-old Fireman Thomas Dalton was the only man in the group unfortunate enough to have his lack of hair recorded, with ‘bald headed’ being jotted into the notes. We also learn that Patrick Sheady, a 22-year-old laborer, was afflicted with varicose veins, 21-year-old laborer Daniel Morrison was flatfooted, while 22-year-old mason John Hennesey had a speech impediment. Each piece of information adds a little more to our picture of these Irishmen and the lives they led. The scars of these men graphically illustrate the harsh realities of life during this period and serve to dispel any romantic notions we might have about life in the past. 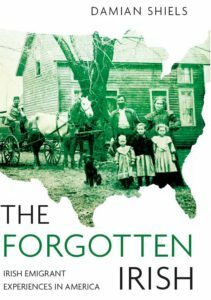 Even without the American Civil War, the population had to contend with the threat of disease, fatal accident or violent death, all of which were near-constant companions for many in the poorer areas of New York. Even before joining the naval war, these men had already overcome significant odds to make it as far as the New York Naval Rendezvous in July 1863. McGuire, Thomas 31 Fireman Scars arms, legs, body & c.
*I am indebted to illustrator Sara Nylund for producing the superb diagram of the scars that were present on these Irishmen. Behbehani Abbas M. 1983. ‘The Smallpox Story: Life and Death of an Old Disease’ in Microbiological Reviews December 1983, pp. 455-509. Fenner Frank, Henderson Donald AInslie, Arita Isao, Jezek Zdenek, Ladnyi Ivan Danilovich 1988. Smallpox and Its Iradication. Houghton Frank and Kelleher Kevin 2002. ‘Smallpox in Ireland- An Historical Note with Possible (and Unwlecome) Relevance For the Future’ in Irish Geography, Vol. 35(1), pp. 90-94. Peter Graham received the scar on his left heel from a gunshot wound at the Battle of Hanover Court House, Virginia, on May 27, 1862, while serving in Co. H of the 25th New York Infantry. A profile for him on ancestry.com says he was born on June 29, 1843 in Ballymahon, County Longford, Ireland. Graham recovered from his wound and returned to his regiment to serve out the rest of his two-year enlistment. He was honorably discharged on July 10, 1863, just before the Draft Riots tore the city apart. In aftermath of that chaos, Graham enlisted for a one-year term in the Navy at the New York Rendezvous on July 18, alongside a fellow comrade from Co. H, Timothy Holland, who was himself the son of Irish immigrants. Holland also bore a scar on his left thigh from his wound at Hanover Court House. Some of the other men listed here may also have been former soldiers. In the book Union Jacks (which I highly recommend), Michael J. Bennett talks a bit about how some army veterans were drawn to the Navy, imagining it as less harrowing means of continuing their service to their country. Given their wounds, Graham and Holland may have been seeking something that involved less marching. Nice work! I am hoping to look into a few of the men’s careers as well, he is clearly one to consider. It would be nice to find out just how many of these men had army service. Union Jacks is a superb book- it is only a pity there are not many more in depth studies of life in the navy, it deserves a bit more attention. Thanks Ciara- there is a wealth of interesting social information in these records, they really are worthy of detailed examination! That is an incredible list, Charles Smith, machinist who had lost his little finger that one was certainly a work related accident, I have come across a lot of machine related accidents. Thanks! I hope to expand it at some point to get a wider picture of the Irish recruits. I daresay out of 319 applicants today that, absent the smallpox scars, the number possessing scars wouldn’t be significantly lower than this group in 1863. All of us – at least all of us who didn’t have hovering “helicopter parents” and had something of a normal, play-outside childhood with all its attendant accidents – rack up some kind of permanent scars. Jackknives slip, hands grasp hot pans, dogs bite. I really don’t see these findings as significant on the surface. Now, should there be a qualitative description of the marks, and they are reported as a “4-inch knife scar” or “gunshot wound”, etc., then you’ve got something.